Here we go! 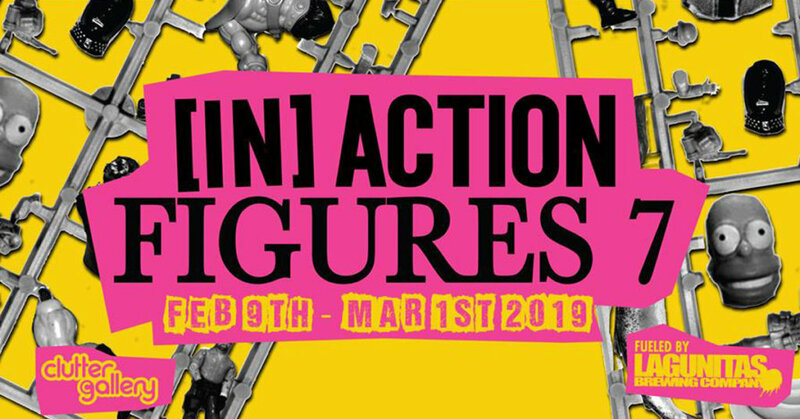 Doors are ready to be opened as Clutter Gallery presents the 7th instalment of ”[In]Action Figures”, Clutter’s annual celebration of the art of the action figure. Expect humour and slapstick comedy from artists from around the world which includes a couple of UK representatives like RYCA, TrapToys, Lisa Rae Hansen aka Ibreaktoys and UMEToys. Curated to elevate the art of action figures, bootlegs and other retro toys, this exhibit recalls the heyday of the Action Figure format – the 1970’s and 80’s. The opening reception will be free to the public and take place on Feb 9th from 6-9pm. The works will remain on display until March 1st, 2019.